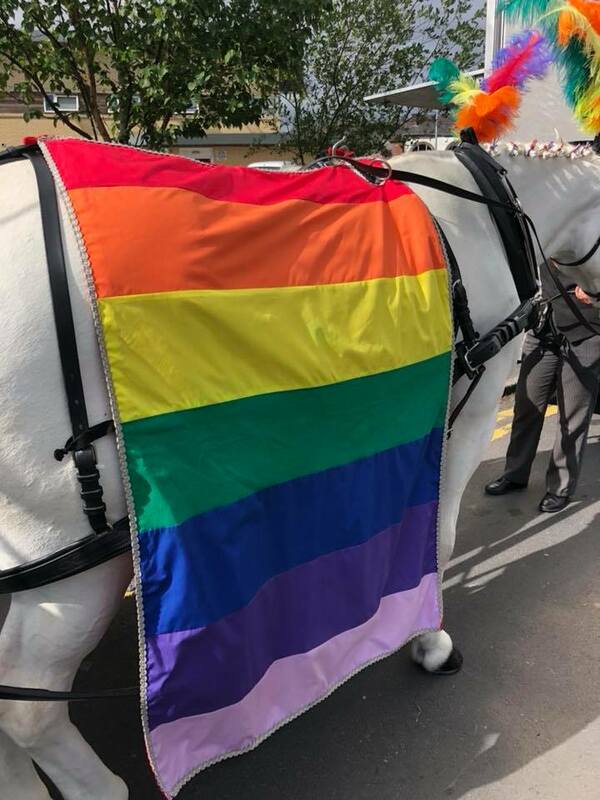 We are proud to say that our rainbow hearse- the world's first of it's kind- officially joins our fleet of carriages and is available to hire for funerals throughout the country. This purpose-built horse drawn funeral hearse carriage was tastefully spray-painted by a local artist. As with our other hearse carriages, the side is fitted with handcrafted etched glass for a clear view of the coffin or casket. 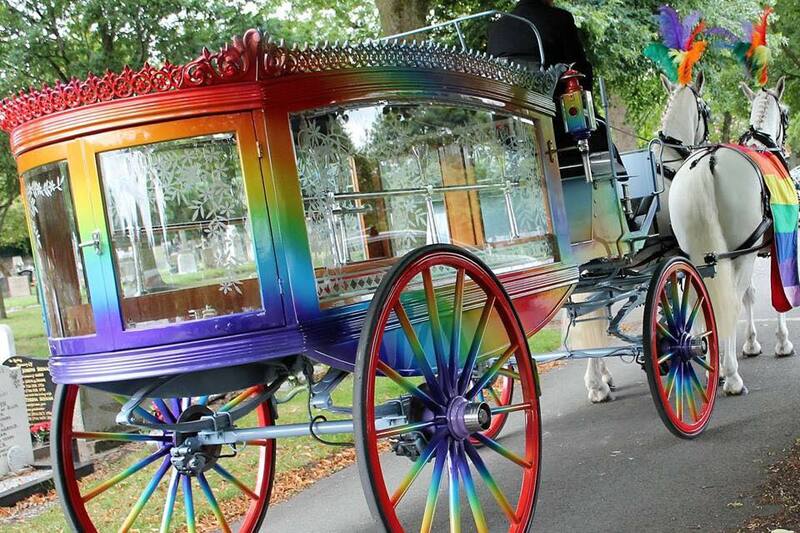 This brightly coloured horse drawn hearse is fitting for a truly unique and memorable send-off. 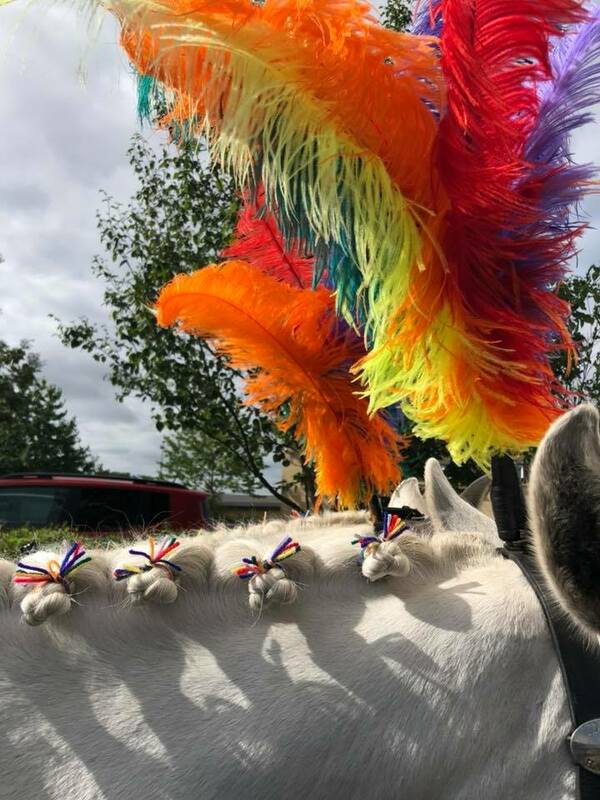 Whether it's drawn by our stunning white Irish Sport horses or black Friesians, the matching rainbow flag drape and plumes are visually impressive to say the least. You can choose from a mono-coloured pair or a team of 4-6 horses. For a more interesting composition, you can also choose to mix and match and have a "domino" team of both colours. The hire also include two professional coachmen who will be dressed in formal attire (top hat included). If there are specific colour themes to the funeral, we are more than happy to customise our attire, such as wearing colourful ties. Over the years we have worked with funeral directors throughout the North West to provide a reliable and sensitive service. To avoid further stress at your time of grief, we can liaise directly with the funeral director and make arrangements for the day. From our central location in Chorley, our rainbow hearse is available for hire across the North West and beyond. As every funeral is different, we will be more than happy to tailor our services to suit the client's specific requirements. Please simply call us to discuss the details of your arrangements. Do the horses have to wear the rainbow drapes and plumes? No, even though the matching drape and plume is very impressive, the client can choose from our large collection of drape and plumes for the horses to wear. If you don't find anything you like, or would like to make a special request, we will try our best to accommodate your requests. Does it cost extra to hire the rainbow hearse? 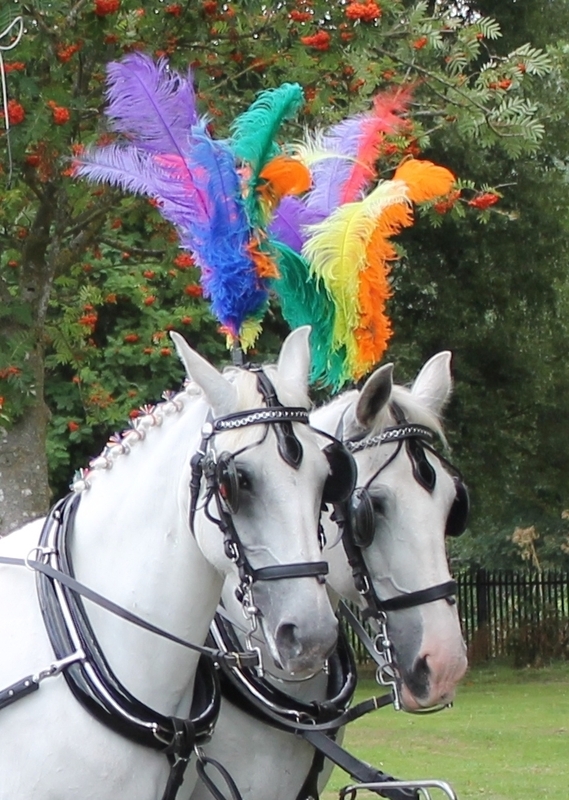 As there is only one in the world, there is a slight premium if you wish to hire our horse-drawn rainbow hearse. Because every funeral is different, our costs and hire package is tailored for each individual client. Please contact us directly to obtain your initial quotation. Can you work directly with my funeral director? Of course. We understand that at this time of hardship, you want things to go as smoothly as possible. We can liaise directly with your chosen funeral director to arrange the details of the hire of the horse drawn funeral hearse. You are of course more than welcome to additionally contact us to make any specific requests.